Step 1: Preheat oven to 350 degrees F (175 degrees C). Grease and flour 3 – 8 inch round cake pans. Whisk the flour, baking soda, baking powder, cinnamon, ginger, and salt in a bowl, and set aside. Step 2: Cream together the sugar, mayonnaise, eggs, and vanilla extract with an electric mixer until blended, scraping the bowl occasionally. Stir in the flour mixture, then fold in the carrots, pineapple, pecans, and cranberries. Divide evenly between the prepared cake pans. Step 3: Bake in preheated oven until a toothpick inserted into center comes out clean, 30 to 35 minutes. Cool in the pan for 10 minutes, then remove from the pan, and allow to cool completely on a wire rack. 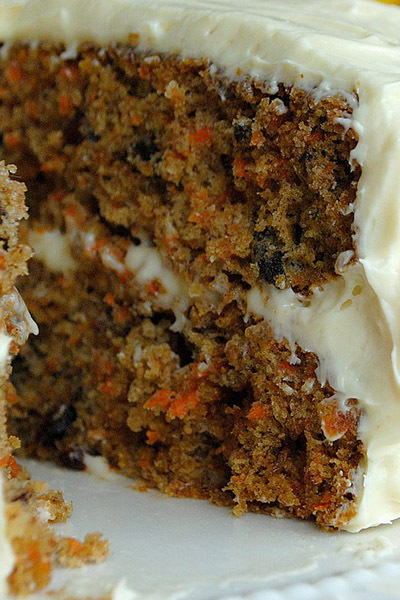 Use your favorite cream cheese frosting to ice the cake! Enjoy this easy fall cake recipe from AllRecipes!